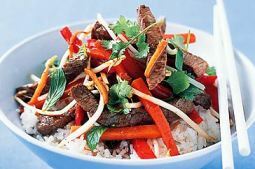 Spice up your night with this tasty, healthy Asian-inspired meal. Add 1 tbs of oil to a wok on high heat. Add half the beef and stir-fry for 1-2 mins. Repeat with remaining beef. Heat remaining oil over mediumhigh heat. Add carrots, capsicum, lemongrass, ginger and garlic. Stir-fry for 2 mins. Add soy sauce, sweet chilli sauce and lime juice. Toss well. Return beef and toss through. Remove from heat and toss in half the coriander and mint. Serve with remaining coriander, mint and rice.